I LIKE AREQUIPA. I ended up telling everybody I meet along the road that Arequipa is my favorite Peruvian city when in fact I fell in love with it since the very first day. 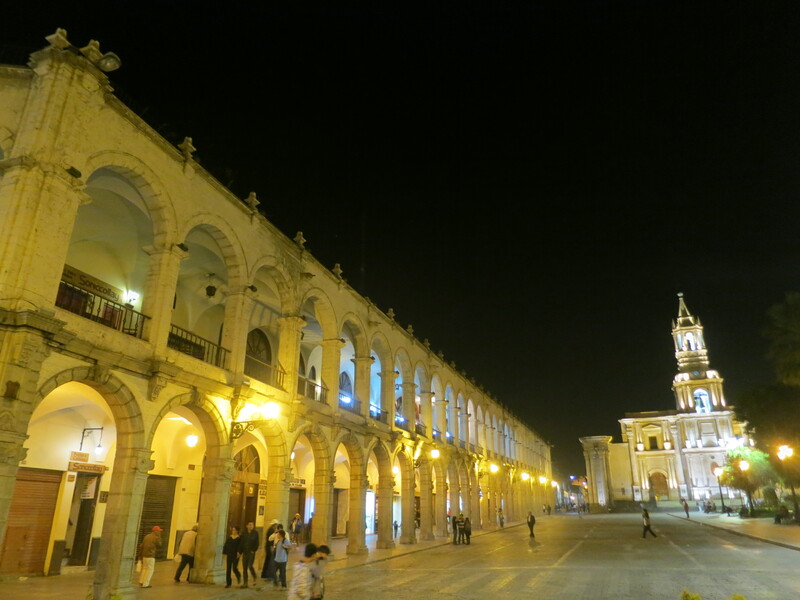 Clean, white and interesting; Arequipa’s charm is fully expressed through its vibrant Plaza de Armas. Crowds of tourists and locals wander at the main square day and night. The people exhibit a hardworking work ethic while retaining a relaxed feel. The weather, sunny yet cool. It is just a perfect place to be. I started the day with a short bus ride to the Recoleta museum. A Franciscan convent that holds many pre-Inca artifacts, this museum is small but interesting enough for an hour or two. A short walk away is the Yanahuara mirador (which means viewpoint). There are two cute alpacas in the park and no other tourists to be seen. I really like to pretend to be just another local but my attire gave me away. THERE ARE QUITE A LOT OF VEGETARIAN CHOICES IN AREQUIPA. However, here in Latin America, lunch is the meal of the day and so many eateries do not serve dinner. A typical set lunch menu costs S./8-10, and consists of an entrada, sopa, segundos, fruta and refreshar. Rice and beans are a common staple but there are more choices than what I would expect. Lights brighten the main square as soon as dusk kicks in. Things slow down, there were less vendors, and crowds of families were replaced by groups of young couples. I must have sat on the bench for too long, taking in the cool night breeze and feelings of contempt. Arequipa is truly a city worth savoring.